America's military forces are dropping "cyber bombs" on Islamic State terrorist groups for the first time, Deputy Defense Secretary Robert Work told reporters accompanying him on a military flight on Tuesday. The ISIS internet attacks, whatever the particulars really may be, are part of a stepped-up coordinated effort to put increasing pressure on the militant organization. "Those guys are under enormous pressure. Every time we have gone after one of their defended positions over the last six months, we have defeated them. They have left, they have retreated," Work told reporters on a military plane en route to a Colorado air base. He said U.S. and coalition forces were putting pressure on Islamic State from all directions, using every possible military capability, including cyber attacks, to defeat the group. And that's all the detail we have, which isn't much. 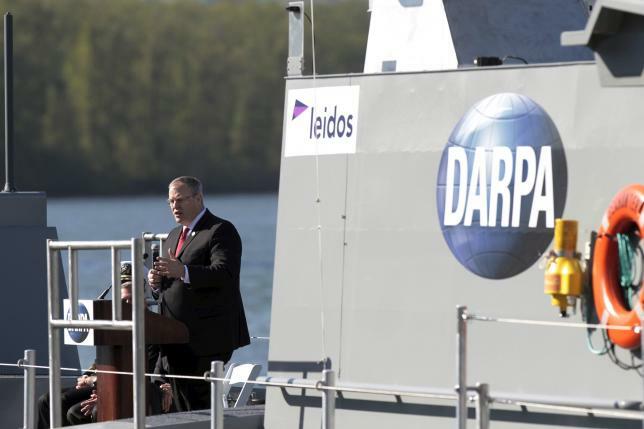 PHOTO: "Robert Work, U.S. Deputy Secretary of Defense, speaks at a christening ceremony for the autonomous ship "Sea Hunter", developed by DARPA, in Portland, Oregon before its christening ceremony April 7, 2016. REUTERS/Steve Dipaola"